Modern Mississauga is in Montreal for four days to experience the renowned Montréal en Lumière festival along with Brigitte Hasbron from The Food Tease. In this four-part series, we’ll be sharing our experiences with you. Located in the heart of the festival and cultural district, Brasserie T! offers guests refined dishes that exudes the creativity of Executive Chef André Sterling. Starting a Saturday morning with a two-course winter brunch featuring black truffles is without a doubt the best way to start your weekend. I started my truffle love voyage with their rendition of mushrooms and soft-boiled egg. I was in heaven when I learned that the mushrooms had been marinating and cooked in truffle juices. The flavours were beyond description except superbly delicious! As for my main I opted for their benedict eggs and ham. This wasn't your typical eggs Benny as freshly shaved black truffle was embedded into their hollandaise sauce. Sheer perfection as it gave a new twist to an old classic brunch item. Chef Sterling has a gold mine of a concept with this black Truffle brunch. We walked right by this fairly large sized building that's been a permanent fixture on the street for over six years....maybe we need glasses. I like truffles but by no means do I love them as much as Brigitte. I opted to start with the smoked salmon, which always beats a soft boiled egg (it's a consistency thing for me) and then opted for the sausage and egg for my main, which was cooked perfectly. My personal tastes require a bit of pepper with my eggs and ketchup and or hot sauce with my breakfast meat. Regardless, it still hit the spot. I spoke with our extremely kind and courteous waitress, Andréane, and she mentioned that T! is buzzing year round at all times of the day. She, along with the majority of customers, love the wide open concept, plenty of windows and the streetscape view. I could easy sit tight for a couple of hours with a scotch and people watch. I haven’t been to many circus acts in my life and the ones I have attended were done when I was far younger. Since I was due for a circus-esque act, I figured I should see what I’ve been missing out on via the Coups de Coeur show. With nine different acts ranging from acrobatics, straps, Cyr Wheel (an oversized hulahoop) and a few others, the audience consisting of mainly families seemed to be happily entertained based on the amount of applause throughout the performance. It’s labelled as a variety show to celebrate and reveal the impressive athleticism of the performers through acts (both local and international) that are only a few minutes in length. One act that stood out to me was Charlie Wheeller who commanded the Cyr Wheel with incredible precision and there were various ovations throughout the performance for his mastery. The concept behind Coups De Coeur was to bring circus artists together to tell a story and move us. and I believe they have. The show consisted everything from acrobatics to juggling acts, to performers using the Russian bar to entertain us. With some audience participation, the show is interactive and treats guests with acts that have competed and achieved accolades around the world. For the ladies out there, there's an act from the Cirque du Soleil that features what resembles to be two Adonis-like sculpted gods performing what seems to be impossible body movements that will leave you awe-struck. FLUKE: Citrus gravlax, lemon gel, cardamom yoghurt compressed prunes and hazelnut. SNAPPER: Cured snapper, mountain tea gel, grapes, radish, horseradish, lemon balm. STRIPPED BASS: Grilled stripped bass, parsley root milk, charred zucchini, asparagus and parsley oil. 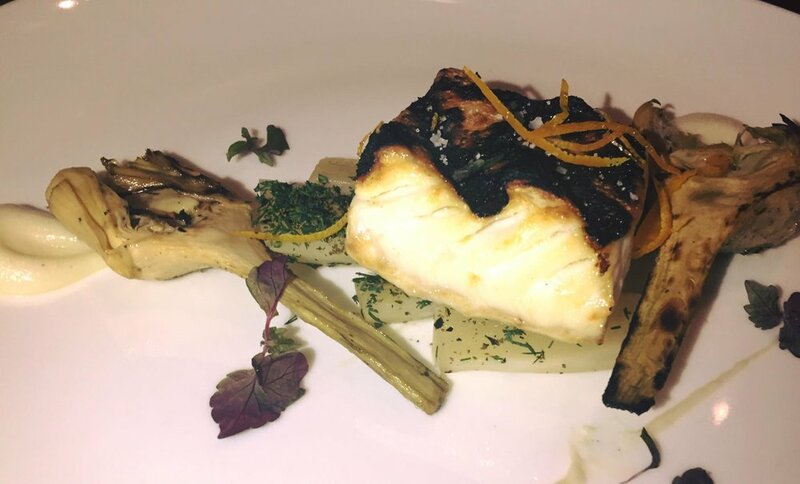 HALIBUT: Josper grilled halibut, tangerine infused salsify, artichokes, shiso. SABLEFISH: Samos and miso roasted sablefish, turnips, porcini mushrooms, mushroom flavored dashi and mushroom broth. SWORDFISH: Grilled swordfish, Jerusalem artichokes, whelks, porcini, white wine sauce. MONKFISH: 'Alentejana' style roasted monkfish, red pepper glazed monkfish, clam in a white wine, tomato and dark chicken stock, and coriander. LOBSTER: Saffron-butter poached lobster, chorizo, fennel and orange tortellini, bouillabaisse broth, rouille. Craving for some fish for quite some time, I was pleased to hear that we would be dining at Ikanos, a modern Greek restaurant offering a seafood tasting menu during the Montreal en Lumiere festivities. As I enjoy seafood quite a bit, I couldn't have been happier! Chef-Owner Constant Mentzas has stayed true to his goal in that the various seafood offerings are the stars of his Mediterranean cuisine eatery. It's certainly something to be very proud of. With every course that we had, with every different fish that we tasted, I kept thinking how was the current dish going to be out shined by the next. I'm not sure how he did it, but Chef Mentzas pulled it off. The flavours were outstanding and they even had my favorite fish on the menu, the poor man's lobster, Monkfish. Most of the fish I've had has been the "popular" fish (halibut, cod, salmon, etc.) and I hadn't heard of a Monkfish, Sablefish or Fluke until tonight. But, not being one to turn down new foods, I opted for the sampler menu to broaden my "yup, I've had that" list. Everything was presented beautifully and was prepared eloquently, with the waitress explaining in detail what was on the plate. What stood out for me was the Sablefish, as it had a smooth taste that was light yet filling and the saffron-butter poached lobster, which has ruined Red Lobster for me due to its absolutely delicious taste and blend of just-right flavours. One of the all-time jazz guitar greats with a career exceeding 40 years, this was something I was looking forward to for weeks leading up to this visit. As my own musical career approaches 30 years (really not the same as Di Meola’s) we’ve taken very different paths. His Latin-influenced jazz fusion style that’s mesmerizing and captivating had the audience’s full attention throughout. My path consists of teaching the new generation of guitarists how to play Taylor Swift, Bruno Mars and Demi Lovato. Di Meola’s band is as impressive and unified as they come, with precision stops and starts, smiles on all their faces constantly and supporting this guitar virtuoso as he ran his fingers up and down the fret-board. After putting out 24 albums, recovering from a bout of tinnitus and being named Guitar Player Magazine’s best jazz guitarist from 1977 to 1981, this guitar guru is happy to be back via his recent album, Elysium, which sees him continue to show why he’s one of the all-time great jazz guitarists. With the sold out concert venue it was easy to see that Al Di Meola is a favorite amongst guitar enthusiasts. Till recently I had not heard of him and quickly did some research. I was hoping to hear some of his Latin-influenced jazz fusion, but I wasn't so fortunate, unless I missed it upon our late arrival due to the weather and Saturday night traffic. Fans could be seen taking down notes of Di Meola's newer songs, as he paid commemorated some of the songs to his children.